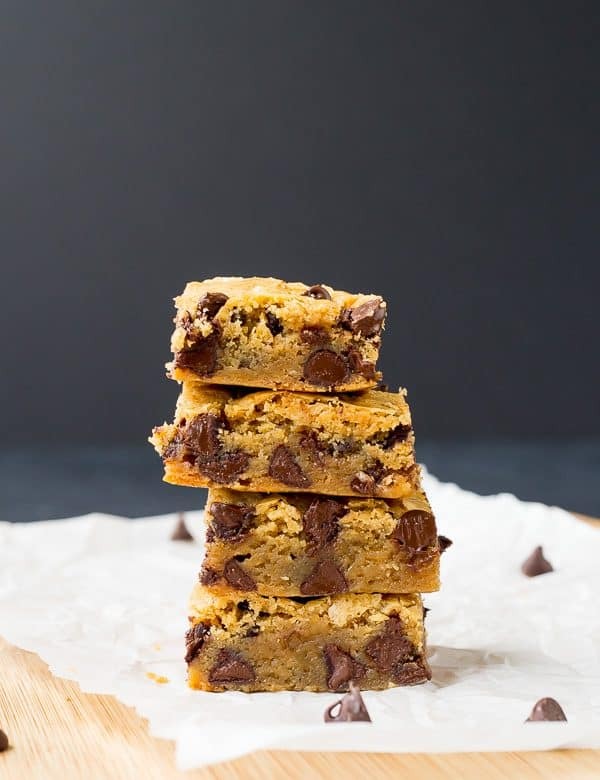 These chocolate chip blondies only take 6 ingredients (plus salt) and come together so easily. 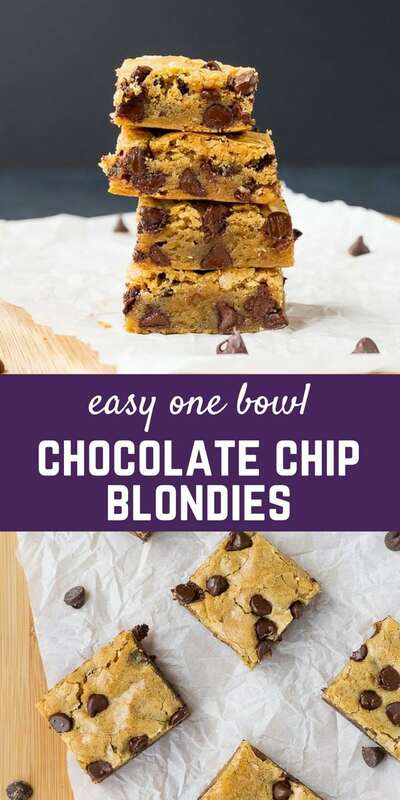 They’re everything you want in a blondie – rich and moist with the perfect addition of chocolate chips! 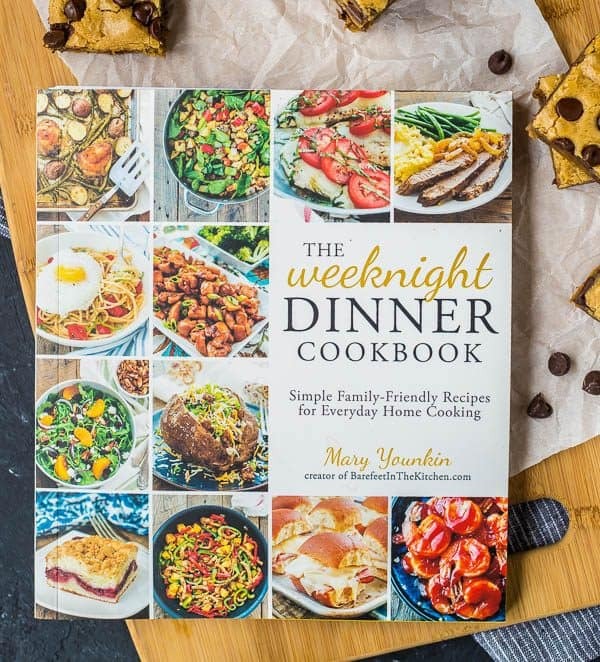 When we were in the middle of our move (which was almost a year ago — INSANE), my friend Mary of Barefeet in the Kitchen released her first cookbook. She was kind enough to send me a copy, knowing that I probably wouldn’t give it the love it deserved. I was living Monday – Friday without Ben because he had already started his job across the state. I was packing boxes, keeping the house in a ready-to-show state, running my business, and taking care of my kids, then 3- and 5-years-old. Mary and I are good enough friends for me to say that the book pretty much went straight into a box after a quick flip through the pages. She knows I still love her. So, I finally pulled The Weeknight Dinner Cookbook out (off the shelves — I promise, it’s been out of the box for a long time). And now I’m kicking myself for not doing it sooner! This cookbook rocks. It’s SO up our alley here at Rachel Cooks…you guys, if you love my quick and easy recipes, you’re going to adore this book. It’s like Mary wrote this book just for me. But I know she didn’t, because who doesn’t love to cook quick and easy meals? 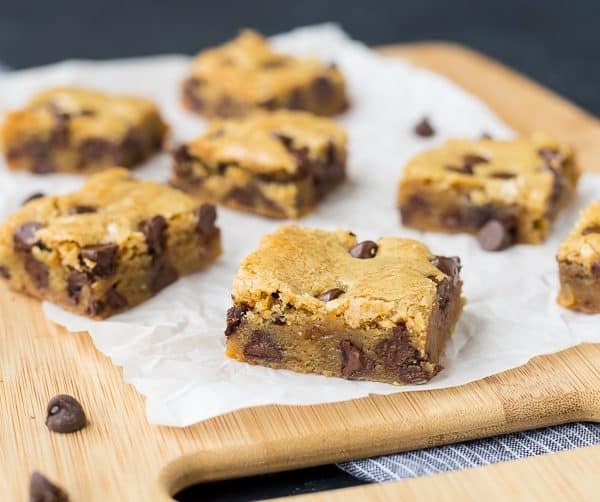 These chocolate chip blondies called my name right away. Baking isn’t my strongest suit (I can whip up a quick dinner out of almost anything in the fridge though), so I always jump at the chance to follow a recipe when it comes to baking. 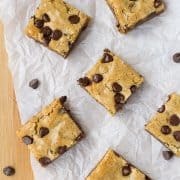 These chocolate chip blondies were so easy to make and my family loooooved them. I couldn’t stop eating them, either. Other recipes I can’t wait to try in this book are Sweet Chipotle Chicken Bites, Korean Beef with Quick Asian Pickles, Fish Tacos with Jalapeño Lime Sauce, Chicken Parmesan Meatloaf, Cajun Roasted Potatoes, Lemon Lover’s Pound Cake, and Cinnamon Toast Cake. 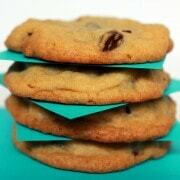 Stir in chocolate chips, reserving a couple of tablespoons to sprinkle on top if desired. Spread batter into prepared pan. 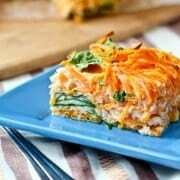 Bake for 25 to 28 minutes or until a toothpick inserted in the middle comes out with moist crumbs. The blondies will be slightly browned around the edges. Cool for at least 20 minutes in the pan before lifting the blondies out by the parchment paper. Set on a wire rack to finish cooling before slicing and storing in an airtight container. Recipe from The Weeknight Dinner Cookbook by Mary Younkin. Recipe directions modified slightly. Verdict: I could have easily eaten the whole pan. I ate one for breakfast on Mother’s Day. BECAUSE I CAN. Husband’s take: Ben loved these — this is his kind of dessert. He loves my classic whole wheat chocolate chip cookies so anything similar to that is a win with him. The kids were obsessed with these too, no surprise there! Changes I would make: None at all! But, Mary suggests some great add-ins in the book and also gives directions on how to make these blondies gluten-free. How can I double it? Double all the ingredients and prepare as directed. 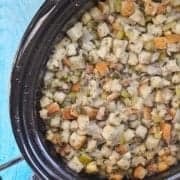 I haven’t made a double batch of these, but I would use a 9×13 pan and start with 30 minutes, increasing baking time as needed until a toothpick inserted in the middle comes out with moist crumbs. The blondies will be slightly browned around the edges. Let me know how it goes! Such good blondies!! Not cakey (which I loved) and so flavorful. Definitely the best batch of blondies I’ve ever made–thanks Rachel! So glad to hear it! Thank you for taking the time to come back and leave a comment! Are these blondies that amazing. Sorry, I always do this when I am trying new recipes. I would hate to waste all those ingredients. I am making them for my sisters baby shower and there will be about 65 people . I am a at home baker, and I lost my grandmothers recipe. please get back to me as soon as possible! Yes, they are! I hope you try them and love them! Thank you so much for responding to me that quickly. usually I have to wait days. You’re welcome! I hope you love the blondies! 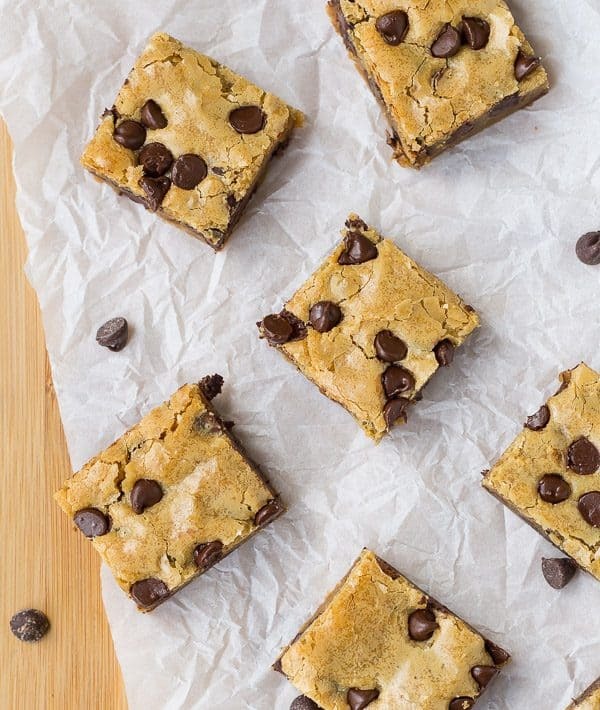 These blondies are seriously amazing. Made these for my friends almost everyday and they thought they were store bought or enchanted with some kind of magic, they just loved them so much. Best blondie recipie ever. Thank you for posting!!!! Yay! I’m so happy you and your friends like these — I was LOLing at “enchanted with some kind of magic” – I love that! Thanks for taking the time to come back and leave a comment! I am thrilled that you enjoyed the blondies! Thanks so much for all the cookbook love too. Your photos are gorgeous and now I wish I had one of these blondies in front of me for breakfast.